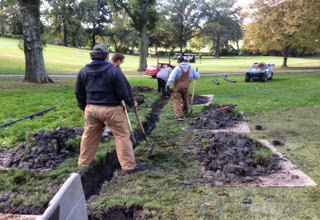 The staff finished the prep work on the collar nursery near 16 tee. We reduced the size to make it more manageable. It was seeded on Friday and should begin to germinate by late next week. The greens nursery was mowed for the first time on Friday. We are mowing it at a little over a 1/10" higher than our regular height of cut. We will be topdressing the green to help stabilize the plants and protect the crowns from mowing. We will lower the height of cut every week or so as growth warrants. 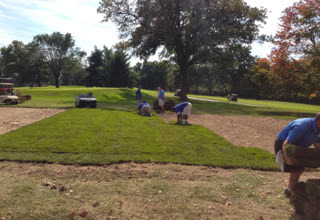 Staff finished laying fescue sod on the old part of the nursery that was filled with dirt. Collar nursery seeded and water running to help keep the seed bed moist. 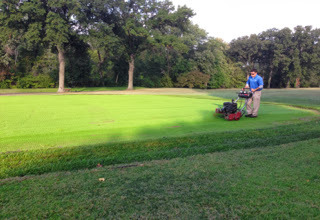 Tom walking mowing the green nursery near 18 tee. 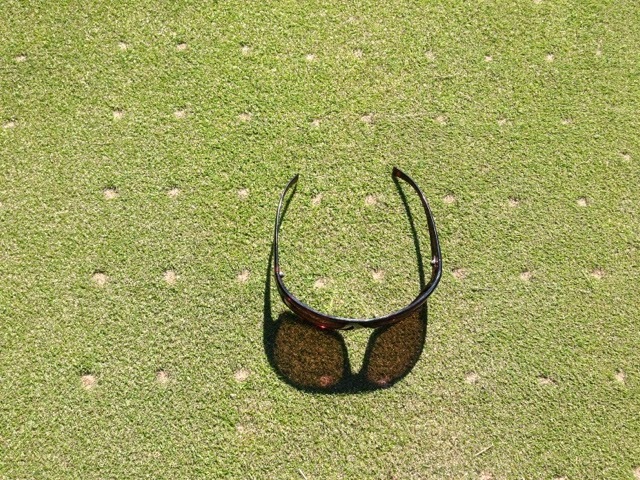 We will mow without baskets for a few weeks to help add a little thatch back to the green. Also with extra fertilization to encourage growth, the clippings being returned back to the sand will provide some added nutrient value to the new turf. The damage to #3 is thankfully improving and beginning to grow. Still off color but improving each day. Always hate to have to post a message about an error. 3-4' along the right side of 3 green was accidentally damaged from a spray application this past week. 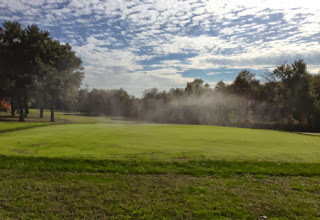 I was spraying out Bermuda along the collar and inadvertently turned on the boom that was over the green. At the time I did not realize this had occurred. Spraying off an accidental mishap would probably have limited the damage. We've rinsed the area and have placed a couple of products down to hopefully limit the damage. It is obviously off color. My hope is the incoming rain, cooler weather and not mowing that section of green for a few days will allow it to recover. Normally I would not have a boom over the green to prevent the chances of an accident. Long story short, a weed killer is causing this issue. Il will probably know in the next 5-7 days. It is my hope that a majority of it will survive. I will keep you posted. In the middle is the edge of the damage to the collar. There is about 20-30" of collar which is showing damage as well. The zoysia/Bermuda intermediate which was supposed to be sprayed is on the right and is slightly off color as it should be. The staff over the next few days will be using a slit seeder to incorporate a Fescue/Bluegrass mix into the rough. We will be concentrating our efforts around green complexes and first cut rough areas that come into play. Some of these areas will include the back green surrounds of #5,6,8,16 which have substantial amounts of bermuda. 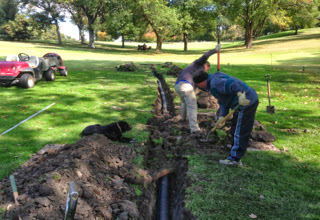 Last season, in an effort to reduce costs during the bunker project, I did not sod the back sections of these green complexes. The slit seeding of these areas will give these complexes a more attractive look and will make the turf type consistent throughout the entire complex. We will be keeping a 7' intermediate cut around #8 and #16 because of the severity of the slope of the greens. You should see germination of the seed within the next couple of weeks depending upon the amount of moisture that we receive. 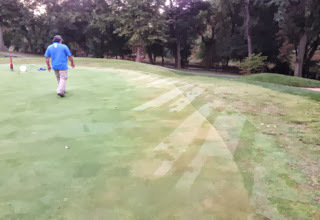 It is rather difficult to fully irrigate these areas because 1/2 the moisture goes onto the fairways. 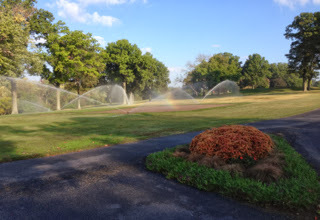 We attempt to keep the zoysia relatively dry during the fall. 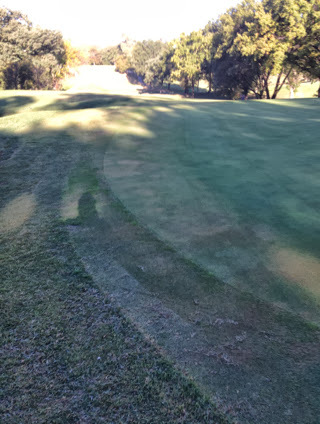 Drier turf reduces the onset of Large patch in our Zoysia fairways. Speaking of zoysia fairways, I sprayed 7.3 acres of fairways with our bermuda eradication product today. That is about 25% of our fairway acreage. 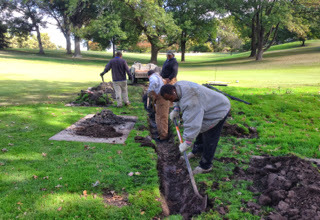 This includes parts of holes 1-5, 7-8, 10, 13, and 15. 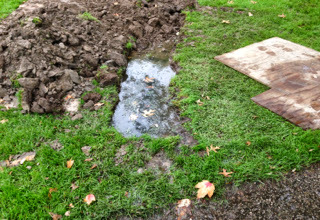 This product will severely injure the bermuda as it goes into dormancy and will delay it breaking dormancy next spring. We will then go into some of these areas and make another application next spring. Russ slit seeding into the area in front of #4 tee and #11 green surround. Jason dragging the left side of #3. The drag helps to smooth over the slit and places the seed in better contact with the soil which assists in germination.